By Fumihiko Maki. In St. Louis. Being dedicated today. Deserves praise. For its restraint. Ever watch the ten o’clock news and they show baseball highlights of just the home runs and you think, “those weren’t the best plays. Not the highest achievements that day and not the best moves for the team.” And the media coverage even affects how the game gets played and how the players get paid. Same with our cultural coverage. We devote too much space to the grandiose, the bloated, the solipsitic sculptural overly sculptural effect. Read about Maki’s gift here. 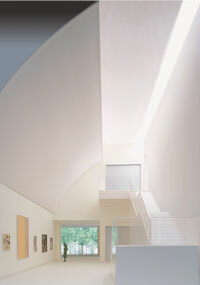 Top photo: Saligman Family Atrium, Mildred Lane Kemper Art Museum, Sam Fox School of Design & Visual Arts. Maki & Associates, Tokyo. 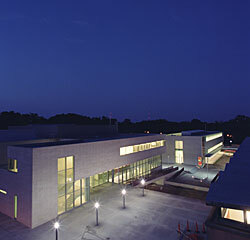 Construction nears completion on the southern facades of the Kemper Art Museum (foreground) and Walker Hall. July 2006. You are currently browsing the archives for the Maki category.